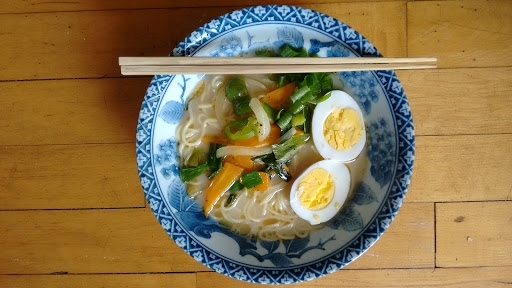 Chef, home-cook, parent, traveler, and owner of Tanpopo Studio, Koshiki is locally known as the past owner/chef of the beloved Tanpopo Noodle Shop in St Paul, MN, where she served steaming and nourishing bowls of Japanese soup for many years to adoring eaters. She was raised on a small island off the coast of mainland Japan, among cooks and resourceful folk. The foods of that place, the values and skills gleaned there, seem to find their way into her own everyday approach to cooking to eating. It is important for me to feed the family of 4 well balanced meals every day, which means, some vegetables, some grain, some meat, some eggs, some fish and some tofu (our kids love tofu!!). We probably eat Japanese food every other day and I bake muffins and scones so our kids are not hungry between meals. I always have dried rice at home which I can cook with vegetables and protein. For example, sauteed cabbage and ground pork with soy sauce or fried rice with eggs and vegetables. Pasta with cream sauce, bacon and vegetables is also something quick and easy I can make that everyone likes. When I was growing up, I often visited my aunt in the city of Kumamoto, Japan who is a chef. The dishes she prepared always amazed me as a young girl and to this day I make many dishes inspired by her cooking. I am working on a culinary tour business as I am most interested in meeting people in Japan who grow their own food, prepare their food and are keeping the tradition. It is very important that these farmers and individuals are able to be self-sufficient for their lifestyle as well as sharing their beliefs about the importance of food. If my family prepares me a dish with care and love, I would take that as my last meal. Just no processed food please.